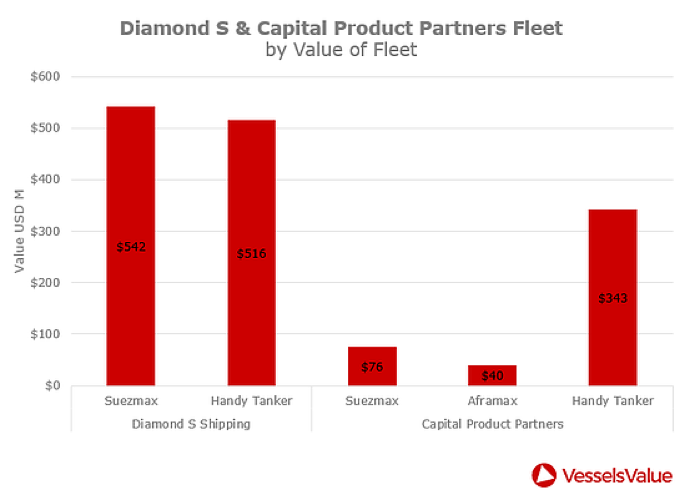 Diamond S Shipping and Capital Product Partners have announced the merger of their product and crude tanker fleets. The new Diamond S Shipping Inc. fleet will contain 68 vessels, made up of 43 tankers from Diamond S Shipping and 25 from Capital Product Partners. The merged fleets will own the second biggest Handy Tanker fleet, owning a combined 52 vessels. The only larger Handy Fleet in the world is owned by Torm, the publicly listed Danish shipowner. Capital Product Partners will retain control of one Capesize Bulker and 10 Post Panamax Containers. This merger will be most significant in the MR2 tanker market. The trading areas of the two fleets is varied, CPLP appears to bring commercial relationships with operators well entrenched in the Latin American market, particularly Brazil. Diamond S MRs see more activity in the U.S. Gulf, Singapore, and the far east. Regardless of who is ultimately fixing these ships on a day to day basis, the merger now creates an owner with a global footprint in the clean tanker markets. “We appear to be at the bottom of a market cycle for MR tankers, leaving plenty of upside for the asset value of the underlying vessels,” stated VesselsValue.